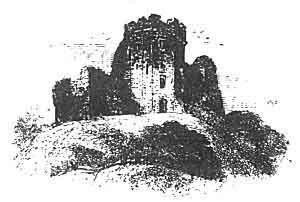 Robert's Tower, Cardiff Castle, 1840.
eminence of his warlike fame, and from the nobleness of his birth, was the most exalted of the nine. And there was no other arrangement respecting the churches than that which we have mentioned above. stag of which the young man spoke?" "I will gladly," said Arthur. "Then will I go," said she. And Gwalchmai said to Arthur, "Lord, if it seem well to thee, permit that into whose hunt soever the stag shall come, that one, be he a knight, or one on foot, may cut off his head, and give it to whom he pleases 143a, whether to his own lady-love, or to the lady of his friend." "I grant it gladly," said Arthur, "and let the Steward of the Household be chastised, if all are not ready to-morrow for the chase." And they passed the night with songs, and diversions, and discourse, and ample entertainment. And when it was time for them all to go to sleep, they went. And when the next day came, they arose; and Arthur called the attendants, who guarded his couch. And these were four pages, whose names were Cadyrnerth the son of Porthawr Gandwy 143b, and Ambreu the son of Bedwor, and Amhar the son of Arthur, and Goreu the son of Custennin 143c. And these men came to Arthur and saluted him, and arrayed him in his garments. And Arthur wondered that Gwenhwyvar did not awake, and did not move in her bed; and the attendants wished to awaken her. "Disturb her not," said Arthur, "for she had rather sleep than go to see the hunting." Then Arthur went forth, and he heard two horns sounding, one from near the lodging of the chief huntsman, and the other from near that of the chief page. And the whole assembly of the multitudes came to Arthur, and they took the road to the Forest. upon a hunter foal of mighty size; and the rider was a fair-haired youth, bare-legged, and of princely mien, and a golden-hilted sword was at his side, and a robe and a surcoat of satin were upon him, and two low shoes of leather upon his feet; and around him was a scarf of blue purple, at each corner of which was a golden apple. And his horse stepped stately, and swift, and proud; and he overtook Gwenhwyvar, and saluted her. "Heaven prosper thee, Geraint," 144a said she, "I knew thee when first I saw thee just now. And the welcome of Heaven be unto thee. And why didst thou not go with thy lord to hunt?" "Because I knew not when he went," said he. "I marvel, too," said she, "how he could go unknown to me." "Indeed, lady," said he. "I was asleep, and knew not when he went; but thou, O young man, art the most agreeable companion I could have in the whole kingdom; and it may be, that I shall be more amused with the hunting than they; for we shall hear the horns when they sound, and we shall hear the dogs when they are let loose, and begin to cry." So they went to the edge of the Forest, and there they stood. "From this place," said she, "we shall hear when the dogs are let loose." And thereupon, they heard a loud noise, and they looked towards the spot whence it came, and they beheld a dwarf riding upon a horse, stately, and foaming, and prancing, and strong, and spirited. And in the hand of the dwarf was a whip. And near the dwarf they saw a lady upon a beautiful white horse, of steady and stately pace; and she was clothed in a garment of gold brocade. And near her was a knight upon a warhorse of large size, with heavy and bright armour both upon himself and upon his horse. And truly they never before saw a knight, or a horse, or armour, of such remarkable size. And they were all near to each other. maiden went up to the dwarf; and the dwarf waited for the maiden, when he saw her coming towards him. And the maiden inquired of the dwarf who the knight was. "I will not tell thee," he answered. "Since thou art so churlish as not to tell me," said she, "I will ask him himself." "Thou shalt not ask him, by my faith," said he. "Wherefore?" said she. "Because thou art not of honour sufficient to befit thee to speak to my Lord." Then the maiden turned her horse's head towards the knight, upon which the dwarf struck her with the whip that was in his hand across the face and the eyes, until the blood flowed forth. And the maiden, through the hurt she received from the blow, returned to Gwenhwyvar, complaining of the pain. "Very rudely has the dwarf treated thee," said Geraint. "I will go myself to know who the knight is." "Go," said Gwenhwyvar. And Geraint went up to the dwarf. "Who is yonder knight?" said Geraint. "I will not tell thee," said the dwarf. "Then will I ask him himself," said he. "That wilt thou not, by my faith," said the dwarf, "thou art not honourable enough to speak with my Lord." Said Geraint, "I have spoken with men of equal rank with him." And he turned his horse's head towards the knight; but the dwarf overtook him, and struck him as he had done the maiden, so that the blood coloured the scarf that Geraint wore. Then Geraint put his hand upon the hilt of his sword, but he took counsel with himself, and considered that it would be no vengeance for him to slay the dwarf, and to be attacked unarmed by the armed knight, so he returned to where Gwenhwyvar was. "Thou hast acted wisely and discreetly," said she. "Lady," said he, "I will follow him yet, with thy permission; and at last he will come to some inhabited place, where I may have arms either as a loan or for a pledge, so that I may encounter the knight." "Go," said she, "and do not attack him until thou hast good arms, and I shall be very anxious concerning thee, until I hear tidings of thee." "If I am alive," said he, "thou shalt hear tidings of me by to-morrow afternoon;" and with that he departed. And the road they took was below the palace of Caerlleon, and across the ford of the Usk; and they went along a fair, and even, and lofty ridge of ground, until they came to a town, and at the extremity of the town they saw a Fortress and a Castle. And they came to the extremity of the town. And as the knight passed through it, all the people arose, and saluted him, and bade him welcome. And when Geraint came into the town, he looked at every house, to see if he knew any of those whom he saw. But he knew none, and none knew him to do him the kindness to let him have arms either as a loan or for a pledge. And every house he saw was full of men, and arms, and horses. And they were polishing shields, and burnishing swords, and washing armour, and shoeing horses. And the knight, and the lady, and the dwarf rode up to the Castle that was in the town, and every one was glad in the Castle. And from the battlements and the gates they risked their necks, through their eagerness to greet them, and to show their joy. an old decrepit woman, sitting on a cushion, with old, tattered garments of satin upon her; and it seemed to him that he had never seen a woman fairer than she must have been, when in the fulness of youth. And beside her was a maiden, upon whom were a vest and a veil, that were old, and beginning to be worn out. And truly, he never saw a maiden more full of comeliness, and grace, and beauty than she. And the hoary-headed man said to the maiden, "There is no attendant for the horse of this youth but thyself." "I will render the best service I am able," said she, "both to him and to his horse." And the maiden disarrayed the youth, and then she furnished his horse with straw and with corn. And she went to the hall as before, and then she returned to the chamber. And the hoary-headed man said to the maiden, "Go to the town," said he, "and bring hither the best that thou canst find both of food and of liquor." "I will, gladly, Lord," said she. And to the town went the maiden. And they conversed together while the maiden was at the town. And, behold! the maiden came back, and a youth with her, bearing on his back a costrel full of good purchased mead, and a quarter of a young bullock. And in the hands of the maiden was a quantity of white bread, and she had some manchet bread in her veil, and she came into the chamber. "I could not obtain better than this," said she, "nor with better should I have been trusted." "It is good enough," said Geraint. And they caused the meat to be boiled; and when their food was ready, they sat down. And it was on this wise; Geraint sat between the hoary-headed man and his wife, and the maiden served them. And they ate and drank. live; and if I do not escape, she will remain unsullied as before." "Gladly will I permit thee," said the hoary-headed man, "and since thou dost thus resolve, it is necessary that thy horse and arms should be ready to-morrow at break of day. For then the Knight of the Sparrow-Hawk will make proclamation, and ask the lady he loves best to take the Sparrow-Hawk. 'For,' will he say to her, 'thou art the fairest of women, and thou didst possess it last year, and the year previous; and if any deny it thee to-day, by force will I defend it for thee.' And therefore," said the hoary-headed man, "it is needful for thee to be there at daybreak; and we three will be with thee." And thus was it settled. which was in my hand on the day when I received the honour of knighthood; and from that time to this I never broke it. And it has an excellent point." Then Geraint took the lance, thanking the hoary-headed man. And thereupon the dwarf also brought a lance to his lord. "Behold, here is a lance for thee, not less good than his," said the dwarf. "And bethink thee, that no knight ever withstood thee before so long as this one has done." "I declare to Heaven," said Geraint, "that unless death takes me quickly hence, he shall fare never the better for thy service." And Geraint pricked his horse towards him from afar, and warning him, he rushed upon him, and gave him a blow so severe, and furious, and fierce, upon the face of his shield, that he cleft it in two, and broke his armour, and burst his girths, so that both he and his saddle were borne to the ground over the horse's crupper. And Geraint dismounted quickly. And he was wroth, and he drew his sword, and rushed fiercely upon him. Then the knight also arose, and drew his sword against Geraint. And they fought on foot with their swords until their arms struck sparks of fire like stars from one another; and thus they continued fighting until the blood and sweat obscured the light from their eyes. And when Geraint prevailed, the hoary-headed man, and his wife, and his daughter were glad; and when the knight prevailed, it rejoiced the Earl and his party. Then the hoary-headed man saw Geraint receive a severe stroke, and he went up to him quickly, and said to him, "Oh, chieftain, remember the treatment which thou hadst from the dwarf; and wilt thou not seek vengeance for the insult to thyself, and for the insult to Gwenhwyvar the wife of Arthur!" And Geraint was roused by what he said to him, and he called to him all his strength, and lifted up his sword, and struck the knight upon the crown of his head, so that he broke all his head-armour, and cut through all the flesh and the skin, even to the skull, until he wounded the bone. Then the knight fell upon his knees, and cast his sword from his hand, and besought mercy of Geraint. "Of a truth,"
said he, "I relinquish my overdaring and my pride in craving thy mercy; and unless I have time to commit myself to Heaven for my sins, and to talk with a priest, thy mercy will avail me little." "I will grant thee grace upon this condition," said Geraint, "that thou wilt go to Gwenhwyvar 151a the wife of Arthur, to do her satisfaction for the insult which her maiden received from thy dwarf. As to myself, for the insult which I received from thee and thy dwarf, I am content with that which I have done unto thee. Dismount not from the time thou goest hence until thou comest into the presence of Gwenhwyvar, to make her what atonement shall be adjudged at the Court of Arthur." "This will I do gladly. And who art thou?" said he. "I am Geraint the son of Erbin. And declare thou also who thou art." "I am Edeyrn the son of Nudd 151b." Then he threw himself upon his horse, and went forward to Arthur's Court, and the lady he loved best went before him and the dwarf, with much lamentation. And thus far this story up to that time. tournament. And Geraint came from the anointing. And the Earl asked him to go to the hall to eat. "Where is the Earl Ynywl," said Geraint, "and his wife, and his daughter?" "They are in the chamber yonder," said the Earl's chamberlain, "arraying themselves in garments which the Earl has caused to be brought for them." "Let not the damsel array herself," said he, "except in her vest and her veil, until she come to the Court of Arthur, to be clad by Gwenhwyvar in such garments as she may choose." So the maiden did not array herself. he received back all that he had lost, even to the smallest jewel. Then spoke Earl Ynywl to Geraint. "Chieftain," said he, "behold the maiden for whom thou didst challenge at the tournament, I bestow her upon thee." "She shall go with me," said Geraint, "to the Court of Arthur; and Arthur and Gwenhwyvar they shall dispose of her as they will." And the next day they proceeded to Arthur's Court. So far concerning Geraint. Now, this is how Arthur hunted the stag 153a. The men and the dogs were divided into hunting parties, and the dogs were let loose upon the stag. And the last dog that was let loose was the favourite dog of Arthur. Cavall was his name 153b. And he left all the other dogs behind him, and turned the stag. And at the second turn, the stag came towards the hunting party of Arthur. And Arthur set upon him. And before he could be slain by any other, Arthur cut off his head. Then they sounded the death horn for slaying 153c, and they all gathered round. Then came Kadyrieith to Arthur, and spoke to him. "Lord," said he, "behold, yonder is Gwenhwyvar, and none with her save only one maiden." "Command Gildas the son of Caw 153d, and all the scholars of the Court," said Arthur, "to attend Gwenhwyvar to the palace." And they did so. told Arthur what that errand was. "Right gladly shall it be so," said Arthur. And thus it was settled. And the next day Gwenhwyvar caused a watch to be set upon the ramparts for Geraint's coming. And after mid-day they beheld an unshapely little man upon a horse, and after him, as they supposed, a dame or a damsel, also on horseback, and after her a knight of large stature, bowed down, and hanging his head low and sorrowfully, and clad in broken and worthless armour. And before they came near to the gate, one of the watch went to Gwenhwyvar, and told her what kind of people they saw, and what aspect they bore. "I know not who they are," said he. "But I know," said Gwenhwyvar; "this is the knight whom Geraint pursued, and methinks that he comes not here by his own free will. But Geraint has overtaken him, and avenged the insult to the maiden to the uttermost." And thereupon, behold a porter came to the spot where Gwenhwyvar was. "Lady," said he, "at the gate there is a knight, and I saw never a man of so pitiful an aspect to look upon as he. Miserable and broken is the armour that he wears, and the hue of blood is more conspicuous upon it than its own colour." "Knowest thou his name?" said she. "I do," said he; "he tells me that he is Edeyrn the son of Nudd." Then she replied, "I know him not." manly, and honourable, and warrior-like, which was to do thee justice, Lady." "Now, where did he overtake thee?" 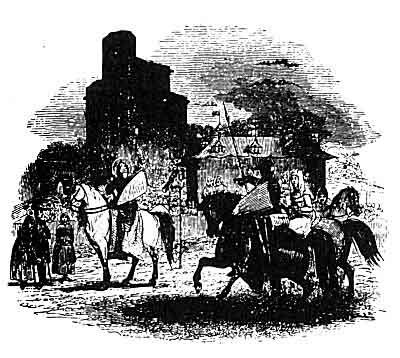 "At the place where we were jousting, and contending for the Sparrow-Hawk, in the town which is now called Cardiff 155a. And there were none with him save three persons, of a mean and tattered condition. And these were an aged, hoary-headed man, and a woman advanced in years, and a fair young maiden, clad in worn-out garments. And it was for the avouchment of the love of that maiden that Geraint jousted for the Sparrow-Hawk at the tournament, for he said that that maiden was better entitled to the Sparrow-Hawk than this maiden who was with me. And thereupon we encountered each other, and he left me, Lady, as thou seest." "Sir," said she, "when thinkest thou that Geraint will be here?" "To-morrow, Lady, I think he will be here with the maiden." with thee Edeyrn the son of Nudd, and cause a chamber to be prepared for him, and let him have the aid of medicine as thou wouldst do unto myself, if I were wounded, and let none into his chamber to molest him, but thyself and thy disciples, to administer to him remedies." "I will do so gladly, Lord," said Morgan Tud. Then said the steward of the household, "Whither is it right, Lord, to order the maiden?" "To Gwenhwyvar and her handmaidens," said he. And the steward of the household so ordered her. Thus far concerning them. the arrogance of Edeyrn the son of Nudd himself that we were not friends. I would not quit him until I knew who he was, and until the one had vanquished the other." "Now," said Arthur, "where is the maiden for whom I heard thou didst give challenge?" "She is gone with Gwenhwyvar to her chamber." Then went Arthur to see the maiden. And Arthur, and all his companions, and his whole Court, were glad concerning the maiden. And certain were they all, that had her array been suitable to her beauty, they had never seen a maid fairer than she. And Arthur gave away the maiden to Geraint. And the usual bond made between two persons was made between Geraint and the maiden, and the choicest of all Gwenhwyvar's apparel was given to the maiden; and thus arrayed, she appeared comely and graceful to all who beheld her. And that day and that night were spent in abundance of minstrelsy, and ample gifts of liquor, and a multitude of games. And when it was time for them to go to sleep, they went. And in the chamber where the couch of Arthur and Gwenhwyvar was, the couch of Geraint and Enid was prepared. And from that time she became his bride. And the next day Arthur satisfied all the claimants upon Geraint with bountiful gifts. And the maiden took up her abode in the palace; and she had many companions, both men and women, and there was no maiden more esteemed than she in the Island of Britain. that time forth loved the stag, and the tournament, and hard encounters; and he came victorious from them all. And a year, and a second, and a third, he proceeded thus, until his fame had flown over the face of the kingdom. And once upon a time Arthur was holding his Court at Caerlleon upon Usk, at Whitsuntide. And, behold, there came to him ambassadors, wise and prudent, full of knowledge, and eloquent of speech, and they saluted Arthur. "Heaven prosper you," said Arthur, "and the welcome of Heaven be unto you. And whence do you come?" "We come, Lord," said they, "from Cornwall; and we are ambassadors from Erbin the son of Custennin, thy uncle, and our mission is unto thee. And he greets thee well, as an uncle should greet his nephew, and as a vassal should greet his lord. And he represents unto thee that he waxes heavy and feeble, and is advancing in years. And the neighbouring chiefs, knowing this, grow insolent towards him, and covet his land and possessions. And he earnestly beseeches thee, Lord, to permit Geraint his son to return to him, to protect his possessions, and to become acquainted with his boundaries. And unto him he represents that it were better for him to spend the flower of his youth and the prime of his age in preserving his own boundaries, than in tournaments, which are productive of no profit, although he obtains glory in them." night were spent in abundance of feasting. And Arthur showed Geraint the cause of the mission, and of the coming of the ambassadors to him out of Cornwall. "Truly," said Geraint, "be it to my advantage or disadvantage, Lord, I will do according to thy will concerning this embassy." "Behold," said Arthur, "though it grieves me to part with thee, it is my counsel that thou go to dwell in thine own dominions, and to defend thy boundaries, and to take with thee to accompany thee as many as thou wilt of those thou lovest best among my faithful ones, and among thy friends, and among thy companions in arms." "Heaven reward thee; and this will I do," said Geraint. "What discourse," said Gwenhwyvar, "do I hear between you? Is it of those who are to conduct Geraint to his country?" "It is," said Arthur. "Then it is needful for me to consider," said she, "concerning companions and a provision for the lady that is with me?" "Thou wilt do well," said Arthur. let him go without sureties, for enough of pain and affliction has he suffered for the insult which the maiden received from the dwarf." "Truly," said Gwenhwyvar, "since it seems well to thee and to Geraint, I will do this gladly, Lord." Then she permitted Edeyrn freely to depart. And many there were who accompanied Geraint, and they set forth; and never was there seen a fairer host journeying towards the Severn 160a. And on the other side of the Severn were the nobles of Erbin the son of Custennin, and his foster-father at their head, to welcome Geraint with gladness; and many of the women of the Court, with his mother, came to receive Enid the daughter of Ynywl, his wife. And there was great rejoicing and gladness throughout the whole Court, and throughout all the country, concerning Geraint, because of the greatness of their love towards him, and of the greatness of the fame which he had gained since he went from amongst them, and because he was come to take possession of his dominions and to preserve his boundaries 160b. And they came to the Court. And in the Court they had ample entertainment, and a multitude of gifts and abundance of liquor, and a sufficiency of service, and a variety of minstrelsy and of games 160c. And to do honour to Geraint, all the chief men of the country were invited that night to visit him. And they passed that day and that night in the utmost enjoyment. And at dawn next day Erbin arose, and summoned to him Geraint, and the noble persons who had borne him company. And he said to Geraint, "I am a feeble and aged man, and whilst I was able to maintain the dominion for thee and for myself, I did so. But thou art young, and in the flower of thy vigour and of thy youth; henceforth do thou preserve thy possessions." "Truly," said Geraint, "with my consent thou shalt not give the power over thy dominions at this time into my hands, and thou shalt not take me from Arthur's Court." "Into thy hands will I give them," said Erbin, "and this day also shalt thou receive the homage of thy subjects." canst receive the homage of thy dominions." So all that had boons to ask were summoned into one place. And Kadyrieith came to them, to know what were their requests. And every one asked that which he desired. And the followers of Arthur began to make gifts, and immediately the men of Cornwall came, and gave also. And they were not long in giving, so eager was every one to bestow gifts. And of those who came to ask gifts, none departed unsatisfied. And that day and that night were spent in the utmost enjoyment. And the next day, at dawn, Erbin desired Geraint to send messengers to the men, to ask them whether it was displeasing to them that he should come to receive their homage, and whether they had anything to object to him. Then Geraint sent ambassadors to the men of Cornwall, to ask them this. And they all said that it would be the fulness of joy and honour to them for Geraint to come and receive their homage. So he received the homage of such as were there. And they remained with him till the third night. And the day after the followers of Arthur intended to go away. "It is too soon for you to go away yet," said he, "stay with me until I have finished receiving the homage of my chief men, who have agreed to come to me." And they remained with him until he had done so. Then they set forth towards the Court of Arthur; and Geraint went to bear them company, and Enid also, as far as Diganhwy 161a: there they parted. Then Ondyaw the son of the duke of Burgundy said to Geraint, "Go first of all and visit the uppermost parts of thy dominions, and see well to the boundaries of thy territories; and if thou hast any trouble respecting them, send unto thy companions." "Heaven reward thee," said Geraint, "and this will I do." And Geraint journeyed to the uttermost part of his dominions. And experienced guides, and the chief men of his country, went with him. And the furthermost point that they showed him he kept possession of. much fame there as he had formerly done elsewhere. And he enriched his Court, and his companions, and his nobles, with the best horses and the best arms, and with the best and most valuable jewels, and he ceased not until his fame had flown over the face of the whole kingdom. And when he knew that it was thus, he began to love ease and pleasure, for there was no one who was worth his opposing. And he loved his wife, and liked to continue in the palace, with minstrelsy and diversions. And for a long time he abode at home. And after that he began to shut himself up in the chamber of his wife, and he took no delight in anything besides, insomuch that he gave up the friendship of his nobles, together with his hunting and his amusements, and lost the hearts of all the host in his Court; and there was murmuring and scoffing concerning him among the inhabitants of the palace, on account of his relinquishing so completely their companionship for the love of his wife. And these tidings came to Erbin. And when Erbin had heard these things, he spoke unto Enid, and inquired of her whether it was she that had caused Geraint to act thus, and to forsake his people and his hosts. "Not I, by my confession unto Heaven," said she, "there is nothing more hateful to me than this." And she knew not what she should do, for, although it was hard for her to own this to Geraint, yet was it not more easy for her to listen to what she heard, without warning Geraint concerning it. And she was very sorrowful. spoken, awoke him; and another thing contributed to awaken him, and that was the idea that it was not in thinking of him that she spoke thus, but that it was because she loved some other man more than him, and that she wished for other society, and thereupon Geraint was troubled in his mind, and he called his squire; and when he came to him, "Go quickly," said he, "and prepare my horse and my arms, and make them ready. And do thou arise," said he to Enid, "and apparel thyself; and cause thy horse to be accoutred, and clothe thee in the worst riding-dress that thou hast in thy possession. And evil betide me," said he, "if thou returnest here until thou knowest whether I have lost my strength so completely as thou didst say. And if it be so, it will then be easy for thee to seek the society thou didst wish for of him of whom thou wast thinking." So she arose, and clothed herself in her meanest garments. "I know nothing, Lord," said she, "of thy meaning." "Neither wilt thou know at this time," said he. road, which they followed till they saw a vast forest, and they went towards it, and they saw four armed horsemen come forth from the forest. When the horsemen had beheld them, one of them said to the others, "Behold, here is a good occasion for us to capture two horses and armour, and a lady likewise; for this we shall have no difficulty in doing against yonder single knight, who hangs his head so pensively and heavily." And Enid heard this discourse, and she knew not what she should do through fear of Geraint, who had told her to be silent. "The vengeance of Heaven be upon me," she said, "if I would not rather receive my death from his hand than from the hand of any other; and though he should slay me yet will I speak to him, lest I should have the misery to witness his death." So she waited for Geraint until he came near to her. "Lord," said she, "didst thou hear the words of those men concerning thee?" Then he lifted up his eyes, and looked at her angrily. "Thou hadst only," said he, "to hold thy peace as I bade thee. I wish but for silence, and not for warning. And though thou shouldest desire to see my defeat and my death by the hands of those men, yet do I feel no dread." Then the foremost of them couched his lance, and rushed upon Geraint. And he received him, and that not feebly. But he let the thrust go by him, while he struck the horseman upon the centre of his shield in such a manner that his shield was split, and his armour broken, and so that a cubit's length of the shaft of Geraint's lance passed through his body, and sent him to the earth, the length of the lance over his horse's crupper. Then the second horseman attacked him furiously, being wroth at the death of his companion. But with one thrust Geraint overthrew him also, and killed him as he had done the other. Then the third set upon him, and he killed him in like manner. And thus also he slew the fourth. Sad and sorrowful was the maiden as she saw all this. Geraint dismounted from his horse, and took the arms of the men he had slain, and placed them upon their saddles, and tied together the reins of their horses, and he mounted his horse again. "Behold what thou must do,"
onset was not more successful than that of their companion. And the maiden stood by, looking at all this; and on the one hand she was in trouble lest Geraint should be wounded in his encounter with the men, and on the other hand she was joyful to see him victorious. Then Geraint dismounted, and bound the three suits of armour upon the three saddles, and he fastened the reins of all the horses together, so that he had seven horses with him. And he mounted his own horse, and commanded the maiden to drive forward the others. "It is no more use for me to speak to thee than to refrain, for thou wilt not attend to my advice." "I will do so, as far as I am able, Lord," said she; "but I cannot conceal from thee the fierce and threatening words which I may hear against thee, Lord, from such strange people as those that haunt this wilderness." "I declare to Heaven," said he, "that I desire nought but silence; therefore, hold thy peace." "I will, Lord, while I can." And the maiden went on with the horses before her, and she pursued her way straight onwards. And from the copse-wood already mentioned, they journeyed over a vast and dreary open plain. And at a great distance from them they beheld a wood, and they could see neither end nor boundary to the wood, except on that side that was nearest to them, and they went towards it. Then there came from out the wood five horsemen, eager, and bold, and mighty, and strong, mounted upon chargers that were powerful, and large of bone, and high-mettled, and proudly snorting, and both the men and the horses were well equipped with arms. And when they drew near to them, Enid heard them say, "Behold, here is a fine booty coming to us, which we shall obtain easily and without labour, for we shall have no trouble in taking all those horses and arms, and the lady also, from yonder single knight, so doleful and sad." a lofty steep; and there they met a slender stripling, with a satchel about his neck, and they saw that there was something in the satchel, but they knew not what it was. And he had a small blue pitcher in his hand, and a bowl on the mouth of the pitcher. And the youth saluted Geraint. "Heaven prosper thee," said Geraint, "and whence dost thou come?" "I come," said he, "from the city that lies before thee. My Lord," he added, "will it be displeasing to thee if I ask whence thou comest also?" "By no means--through yonder wood did I come." "Thou camest not through the wood to-day." "No," he replied, "we were in the wood last night." "I warrant," said the youth, "that thy condition there last night was not the most pleasant, and that thou hadst neither meat nor drink." "No, by my faith," said he. "Wilt thou follow my counsel," said the youth, "and take thy meal from me?" "What sort of meal?" he inquired. "The breakfast which is sent for yonder mowers, nothing less than bread and meat and wine; and if thou wilt, Sir, they shall have none of it." "I will," said he, "and Heaven reward thee for it." he, "to meet the young man, and to conduct him to his lodging." "Go, gladly," said the Earl, "and right joyfully shall he be received here, if he so come." And the youth went to meet Geraint, and told him that he would be received gladly by the Earl in his own palace; but he would go only to his lodgings. And he had a goodly chamber, in which was plenty of straw, and drapery, and a spacious and commodious place he had for the horses; and the youth prepared for them plenty of provender. And after they had disarrayed themselves, Geraint spoke thus to Enid: "Go," said he, "to the other side of the chamber, and come not to this side of the house; and thou mayest call to thee the woman of the house, if thou wilt." "I will do, Lord," said she, "as thou sayest." And thereupon the man of the house came to Geraint, and welcomed him. "Oh, chieftain," he said, "hast thou taken thy meal?" "I have," said he. Then the youth spoke to him, and inquired if he would not drink something before he met the Earl. "Truly I will," said he. So the youth went into the town, and brought them drink. And they drank. "I must needs sleep," said Geraint. "Well," said the youth; "and whilst thou sleepest, I will go to see the Earl." "Go, gladly," he said, "and come here again when I require thee." And Geraint went to sleep; and so did Enid also. And the youth came to the place where the Earl was, and the Earl asked him where the lodgings of the knight were, and he told him. "I must go," said the youth, "to wait on him in the evening." "Go," answered the Earl, "and greet him well from me, and tell him that in the evening I will go to see him." "This will I do," said the youth. So he came when it was time for them to awake. And they arose, and went forth. And when it was time for them to take their food, they took it. And the youth served them. And Geraint inquired of the man of the house, whether there were any of his companions that he wished to invite to him, and he said that there were. "Bring them hither, and entertain them at my cost with the best thou canst buy in the town." will do so," said he. So he arose, and took his leave, and went forth with his attendants. And she told not then to Geraint any of the conversation which she had had with the Earl, lest it should rouse his anger, and cause him uneasiness and care. me?" "My Lord, thou didst not command me to do so, else would I not have allowed him to depart." "What way dost thou think that he took?" "I know not, except that he went along the high road." And they turned their horses' heads that way, and seeing the tracks of the horses upon the high road, they followed. And when the maiden beheld the dawning of the day, she looked behind her, and saw vast clouds of dust coming nearer and nearer to her. And thereupon she became uneasy, and she thought that it was the Earl and his host coming after them. And thereupon she beheld a knight appearing through the mist. "By my faith," said she, "though he should slay me, it were better for me to receive my death at his hands, than to see him killed without warning him. My Lord," she said to him, "seest thou yonder man hastening after thee, and many others with him?" "I do see him," said he; "and in despite of all my orders, I see that thou wilt never keep silence." Then he turned upon the knight, and with the first thrust he threw him down under his horse's feet. And as long as there remained one of the fourscore knights, he overthrew every one of them at the first onset. And from the weakest to the strongest, they all attacked him one after the other, except the Earl: and last of all the Earl came against him also. And he broke his lance, and then he broke a second. But Geraint turned upon him, and struck him with his lance upon the centre of his shield, so that by that single thrust the shield was split, and all his armour broken, and he himself was brought over his horse's crupper to the ground, and was in peril of his life. And Geraint drew near to him; and at the noise of the trampling of his horse the Earl revived. "Mercy, Lord," said he to Geraint. And Geraint granted him mercy. But through the hardness of the ground where they had fallen, and the violence of the stroke which they had received, there was not a single knight amongst them that escaped without receiving a fall, mortally severe, and grievously painful, and desperately wounding, from the hand of Geraint. faith," said Geraint; "I would not go even to thy Lord's Court, excepting Arthur were thy Lord." "By the hand of Arthur himself," said the knight, "I will have satisfaction of thee, or receive my overthrow at thy hands." And immediately they charged one another. And a squire of his came to serve him with lances as he broke them. And they gave each other such hard and severe strokes that their shields lost all their colour 174a. But it was very difficult for Geraint to fight with him on account of his small size, for he was hardly able to get a full aim at him with all the efforts he could make. And they fought thus until their horses were brought down upon their knees; and at length Geraint threw the knight headlong to the ground; and then they fought on foot, and they gave one another blows so boldly fierce, so frequent, and so severely powerful, that their helmets were pierced, and their skullcaps were broken, and their arms were shattered, and the light of their eyes was darkened by sweat and blood. At the last Geraint became enraged, and he called to him all his strength; and boldly angry, and swiftly resolute, and furiously determined, he lifted up his sword, and struck him on the crown of his head a blow so mortally painful, so violent, so fierce, and so penetrating, that it cut through all his head armour, and his skin, and his flesh, until it wounded the very bone, and the sword flew out of the hand of the Little King to the furthest end of the plain, and he besought Geraint that he would have mercy and compassion upon him. "Though thou hast been neither courteous nor just," said Geraint, "thou shalt have mercy, upon condition that thou wilt become my ally, and engage never to fight against me again, but to come to my assistance whenever thou hearest of my being in trouble." "This will I do, gladly, Lord," said he. So he pledged him his faith thereof. "And now, Lord, come with me," said he, "to my Court yonder, to recover from thy weariness and fatigue." "That will I not, by Heaven," said he. afflicted. And he said to Geraint, "My Lord, thou doest wrong not to take repose, and refresh thyself awhile; for, if thou meetest with any difficulty in thy present condition, it will not be easy for thee to surmount it." But Geraint would do no other than proceed on his journey, and he mounted his horse in pain, and all covered with blood. And the maiden went on first, and they proceeded towards the wood which they saw before them. And the heat of the sun was very great, and through the blood and sweat, Geraint's armour cleaved to his flesh; and when they came into the wood, he stood under a tree, to avoid the sun's heat; and his wounds pained him more than they had done at the time when he received them. And the maiden stood under another tree. And lo! they heard the sound of horns, and a tumultuous noise; and the occasion of it was, that Arthur and his company had come down to the wood. And while Geraint was considering which way he should go to avoid them, behold, he was espied by a foot-page, who was an attendant on the Steward of the Household; and he went to the Steward, and told him what kind of man he had seen in the wood. Then the Steward caused his horse to be saddled, and he took his lance and his shield, and went to the place where Geraint was. "Ah, knight!" said he, "what dost thou here?" "I am standing under a shady tree, to avoid the heat and the rays of the sun." "Wherefore is thy journey, and who art thou?" "I seek adventures, and go where I list." "Indeed," said Kai; "then come with me to see Arthur, who is here hard by." "That will I not, by Heaven," said Geraint. "Thou must needs come," said Kai. Then Geraint knew who he was, but Kai did not know Geraint. And Kai attacked Geraint as best he could. And Geraint became wroth, and he struck him with the shaft of his lance, so that he rolled headlong to the ground. But chastisement worse than this would he not inflict on him. in her heart. And Gwalchmai led Geraint onwards along the road, till they came to the place where Arthur was encamped, and the pages were pitching his tent by the roadside. "Lord," said Geraint, "all hail unto thee." "Heaven prosper thee; and who art thou?" said Arthur. "It is Geraint," said Gwalchmai, "and of his own free will would he not come to meet thee." "Verily," said Arthur, "he is bereft of his reason." Then came Enid, and saluted Arthur. "Heaven protect thee," said he. And thereupon he caused one of the pages to take her from her horse. "Alas! Enid," said Arthur, "what expedition is this?" "I know not, Lord," said she, "save that it behoves me to journey by the same road that he journeys." "My Lord," said Geraint, "with thy permission we will depart." "Whither wilt thou go?" said Arthur. "Thou canst not proceed now, unless it be unto thy death." "He will not suffer himself to be invited by me," said Gwalchmai. "But by me he will," said Arthur; "and, moreover, he does not go from here until he is healed." "I had rather, Lord," said Geraint, "that thou wouldest let me go forth." "That will I not, I declare to Heaven," said he. Then he caused a maiden to be sent for to conduct Enid to the tent where Gwenhwyvar's chamber was. And Gwenhwyvar and all her women were joyful at her coming; and they took off her riding-dress, and placed other garments upon her. Arthur also called Kadyrieith, and ordered him to pitch a tent for Geraint and the physicians; and he enjoined him to provide him with abundance of all that might be requisite for him. And Kadyrieith did as he had commanded him. And Morgan Tud and his disciples were brought to Geraint. he, "is it Geraint?" "Yes, in truth," said she. "And who art thou?" "I am the Little King," he answered, "coming to thy assistance, for I heard that thou wast in trouble. And if thou hadst followed my advice, none of these hardships would have befallen thee." "Nothing can happen," said Geraint, "without the will of Heaven, though much good results from counsel." "Yes," said the Little King, "and I know good counsel for thee now. Come with me to the court of a son-in-law of my sister, which is near here, and thou shalt have the best medical assistance in the kingdom." "I will do so gladly," said Geraint. And Enid was placed upon the horse of one of the Little King's squires, and they went forward to the Baron's palace. And they were received there with gladness, and they met with hospitality and attention. And the next morning they went to seek physicians; and it was not long before they came, and they attended Geraint until he was perfectly well. And while Geraint was under medical care, the Little King caused his armour to be repaired, until it was as good as it had ever been. And they remained there a fortnight and a month. eating they arose. And Geraint called for his horse and his armour, and he accoutred both himself and his horse. And all the hosts went forth until they came to the side of the hedge, and the hedge was so lofty, that it reached as high as they could see in the air, and upon every stake in the hedge, except two, there was the head of a man, and the number of stakes throughout the hedge was very great. Then said the Little King, "May no one go in with the chieftain?" "No one may," said Earl Owain. "Which way can I enter?" inquired Geraint. "I know not," said Owain, "but enter by the way that thou wilt, and that seemeth easiest to thee." other fierce and frequent strokes; and at last Geraint became enraged, and he urged on his horse, and rushed upon him, and gave him a thrust on the centre of his shield, so that it was split, and so that the head of his lance went through his armour, and his girths were broken, and he himself was borne headlong to the ground the length of Geraint's lance and arm, over his horse's crupper. "Oh, my Lord!" 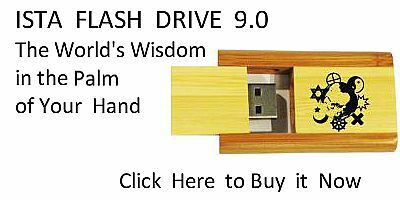 said he, "thy mercy, and thou shalt have what thou wilt." "I only desire," said Geraint, "that this game shall no longer exist here, nor the hedge of mist, nor magic, nor enchantment." "Thou shalt have this gladly, Lord," he replied. "Cause, then, the mist to disappear from this place," said Geraint. "Sound yonder horn," said he, "and when thou soundest it, the mist will vanish; but it will not go hence unless the horn be blown by the knight by whom I am vanquished." And sad and sorrowful was Enid where she remained, through anxiety concerning Geraint. Then Geraint went and sounded the horn. And at the first blast he gave, the mist vanished. And all the hosts came together, and they all became reconciled to each other. And the Earl invited Geraint and the Little King to stay with him that night. And the next morning they separated. And Geraint went towards his own dominions; and thenceforth he reigned prosperously, and his warlike fame and splendour lasted with renown and honour both to him and to Enid from that time forth.